Log in and join the Instagram party @dreamcatcherartistry! Learn how to create that romantic braided crown with help from Toni & Guy! After planning all the little details of your dream wedding, now comes the best part -- choosing the makeup and hairstyle that'll make jaws drop and hearts flutter. Here are some of our favorites, and for the complete list head over to Makeup Tutorials! If you’ve got a berry-themed wedding, I highly suggest following suit and wearing a matching hue on your lips. To help balance the loud color of your lipstick, keep the rest of your makeup neutral by only using shades of beige, tan, and taupe. This is my go-to look whenever I have something adorning my hair, whether it’s a small tiara or a flower crown. Since I already have a lot going on up top, I like keeping my makeup low-key by dusting on just a bit of shimmer eyeshadow on the inner corners of the eye. It makes for a more fairytale look, which is perfect for rustic weddings! All I have to do is pair it with a wine-stained lippy, and I’m good to go! A modern bridal makeup is something that brings a bit of old Hollywood glamor into your makeup. If you want to know how to do bridal makeup like this, it boils down to two things: a cat eye and a bright red lipstick that will make everyone go va-va-voom. Don’t forget to swipe on a bit of highlighter on your cheekbones to finish the look! Channel your inner Aphrodite by pairing your headpiece with falsies, a flawless face, and a coral-tinted lip. Keep your brows natural looking by using a light hand when applying a shade that’s close to your brow color. This is a look that’s perfect for ladies who’ve just gotten back from a holiday and were lucky enough to get a tan at the beach. Now you’ve soaked up a ton of Vitamin D, show off your new color by keeping your makeup simple. Put on some bronzer, get a swipe of mascara, and layer a sheen of gloss on your favorite peach-pink lipstick. "Being a bride is a little bit like being famous for a day: There will be hair and makeup, a beautiful dress, and paparazzi (i.e., the wedding photographer) who will follow you everywhere you go. That last part—being photographed all night long—can be daunting. But getting gorgeous wedding pictures that stand the test of time (unlike Dad’s ’70s flares or Mom’s puffy sleeves) can be one less thing to worry about." 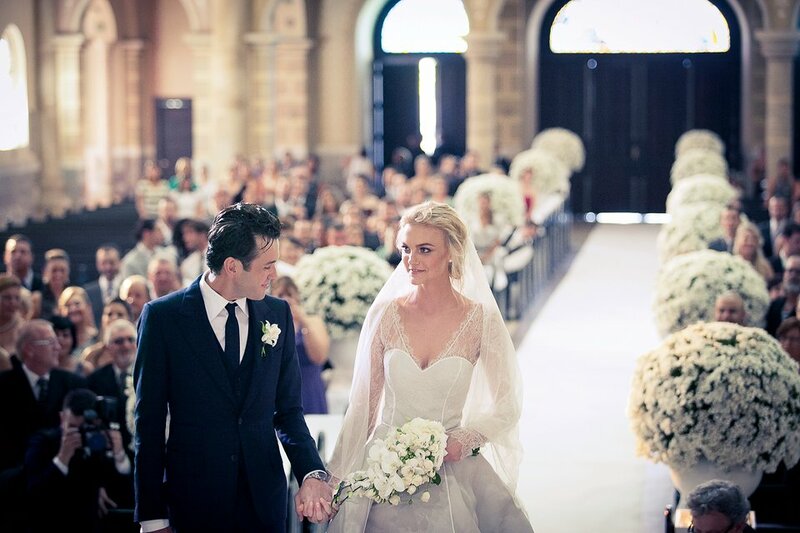 Head over to Vogue to check out their expert advice for taking the perfect wedding pictures! Kick up that California desert charm with these gorgeous wedding color palette ideas from the Knot! Incorporate these not only into your decor, but why not try out a peachy, sun-kissed beauty look or themed hair accoutrements? Let those creative juices flow to help you craft the most memorable (and stylish) wedding of the year! And don't forget to discuss your color palette choices with your bridal beauty team, to come up with the perfect look for your big day. Picture Perfect Weddings with Dreamcatcher Artistry! In the market for that perfect bridal beauty team to give you that drop dead gorgeous wedding look you've been dreaming of? Get inspired by browsing our Weddings portfolio! From brides to the whole wedding party, we have something special for everyone on your big day! We are soooooo excited to announce that the team at Dreamcatcher Artistry have been named as the 2017 Pick for The Best of Weddings on The Knot! Check us out on WeddingWire! O n the hunt for that perfect bridal beauty team for your upcoming nuptials? Read what our awesome clients have to say about us on Wedding Wire! A little preparation can go a long way, especially when it comes to your wedding day! We love these beauty prep tips from The Knot, covering everything from healthy hair prep to skin care and immune boosting supplements. Check it out and check bridal beauty prep off your list! Make a bold statement and update that classic bridal up-do for your wedding day with some of this seasons hottest trends, and have that gorgeous mane looking picture perfect. From statement hair accessories, to sleek ponytails, and loose beachy waves, there are a myriad of options out there to explore with your beauty team to find the perfect look for your big day! Like any good relationship, a solid foundation and a spirit of cooperation are key to success. Whether you know and trust your hairstylist completely, or are working with them for the first time, it's important to do some research and come prepared in order to achieve that wedding hairstyle you've been dreaming of. Check out these tips from The Knot about working with your wedding hairstylist, and confidently walk down the aisle with that glorious mane of yours! Around the World with Dreamcatcher Artistry! Booked flights & hotel, check! Bought the dress, check! Locked the venue, check! Dreamcatcher hair & makeup, check! Jet-setting around the world or flying home for that picture perfect, dreamy wedding location? The expert team at Dreamcatcher Artistry is with you all the way! We have fantastic deals on destination packages so you'll not only have the location of your dreams, but the beauty team to help you put your best face forward. To learn more about our destination packages email us at info@dreamcatcherartistry.com or give us a ring at 805-453-5029! Getting hitched soon? Here to help you plan the wedding of your dreams is the ultimate 2016 style guide from Brit+Co! From rustic chic decor, to hair brooches, bold colors, and dramatic makeup, make your nuptials the talk of the town this year! And remember, our Dreamcatcher expert beauty team is here to help you walk down that ever-so-chic aisle in glamour and style!